Snapper are back on the list for many and rightly so because the time is now to target some big reds as they are entering their bulk up phase before the pending winter slowdown. In close in the early morning light (and by close I mean right by the ramp close) is a great place to start with a flick of a soft-bait. Once that sun and heat gets up for the day, there are some reasonable workups to the east of the cable zone out in the middle gulf, and if you see gannets just sitting around, take the hint, stay and do the same for a while, drift fish for both snapper and kingfish and keep your eye on those gannets. If there are gannets near you, so are fish. Both previous and the new season’s gannets are hungry and are also out there to put on some weight. Competitions are on all around the country with all sorts of species to target by all experience levels of keen anglers. 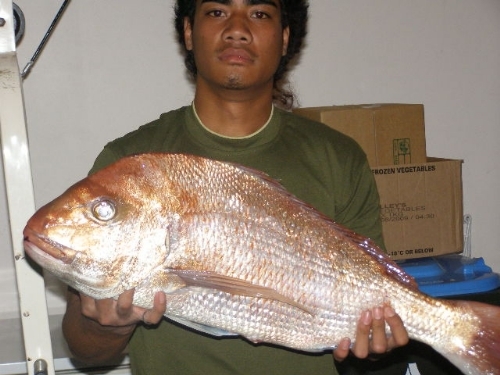 So whether snapper, kingfish, kahawai, marlin, tuna or mahimahi are your thing, autumn has them all! No other season of the year can be so prolific with fishing opportunities as awesome autumn. Get into making memories for life with a whole heap of mates and like-minded people. The elusive skipjack of the Hauraki Gulf have been exciting to see, but getting them to bite can be a challenge at times, sometimes not. Micro jigging continues to be the best method of hooking them up, with trolling another good option – perhaps they will prefer this approach more again soon. Either way, they are big fat barrels of healthy fish, with energy to burn. East of Tiri out from the cable zone is a good area to target them at the moment. The kingfish are still feeding fairly consistently, but we're finding the main issue is getting the entire fish to the boat without being taxed by big bronze whalers! A dozen or more circling the boat can make for some extra adrenaline, and a lot less whole fish coming aboard but they certainly are show stoppers to see. Livebaits have been working very well, live mackerel which has been oh-so-easy to load up on over the open areas out from Gulf Harbour, virtually all the way across to Rangitoto. There are some huge areas of baitfish in the big bay. Jigs and topwater lures at Channel can be a real adrenaline thrill when the kings are on the bite there. As for the marlin, there are increasing opportunities to catch them, and close to the city too! Whether you want to overnight at say Great Barrier and make an adventure of it, or simply go for a big day out and fish the area between Little Barrier, Great Barrier and the Mokohinau Islands, it is prime time for striped marlin (and the odd black!) to be feeding in this area. There are lots of skipjack and other bait supplies there right now, just a couple of hours from Auckland by land or sea. A lot of gear isn’t necessary, two rods, two lures, that’s all you need! No excuses needed to go fishing, it is just a matter of being out there and doing it. Enjoy the start of awesome autumn!